Around lunch Thursday 26 September four people from Malmö City Skaters, Johanna, Oskar, Peter and me, left Malmö for Berlin. After approx 7 hours drive by Peter and including a pic-nic in the German country side we arrived to the home for the weekend, Youth hostel Aletto. After checking in we looked for a place to eat this late hour. Found a nice Tibet restaurant in the neighborhood. First time for Tibetian food, very nice. The plan was to do some sightseeing in Berlin Friday. We ended up spending approx 4 hours at the Sport and Health fair at Tempelhof Airport. Picked up the start number, looking at and buying some merchandise etc. Saturday morning we did a “photo walk” around the hood. Back at the hostel we got ready for the Berlin Inline Marathon, that started 15:30. U-bahn to Französiche strasse, brisk walk to Brandenburger Tor where we meet with the rest of the Malmö City Skaters. Approx. 6.300 participants on small wheels joined this event, the biggest inline race in the world and for the 17th time. After the mandatory and traditional Malmö City Skaters group photo we headed for the starting point. Fantastic atmosphere already, loud music and speaker pep talk. Felt a bit nervous but after start it disappeared and got goose bumps when rolling pass all the spectators that were cheering and making lots of noise. During the 42 km we passed several sights and lots of people along the streets cheering. Remember especially when coming around a turn and this wide boulevard opened up, only with roller skaters, not a car or other traffic in sight. Had good company by Jesper behind me during the first 30+ km. Found different “packs” to follow but feel I need to practice that discipline some more to next year. Since we were a bit late for the common Rolling Vikings dinner, the Malmö crew decided to meet at Steakhouse Asador, Wilhelmstrasse 22. Recomended by Jonas and turned out to be a very nice place with great food. The company was great too :-D.
The 40th. Berlin Marathon started at 8:45 Sunday. After breakfast and checking out we went to Brandenburger Tor area to see some of the action. Approx. 40.000 runners joined and 35.500 finished. Wilson Kipsang also set new WR with nearly the same time as me, 2:03! Since Peter had injured himself during the inline race I drove back to Malmö. Thought I should get tired but Peter’s Audi A3 was nice to drive and it turned out not being a problem at all, was a bit surprised. Left Berlin around 16.00 and returned to Malmö around 24:00. Hope to repeat this event next year, think it’s the same date, 28 September. Registration is here and open 4 November. 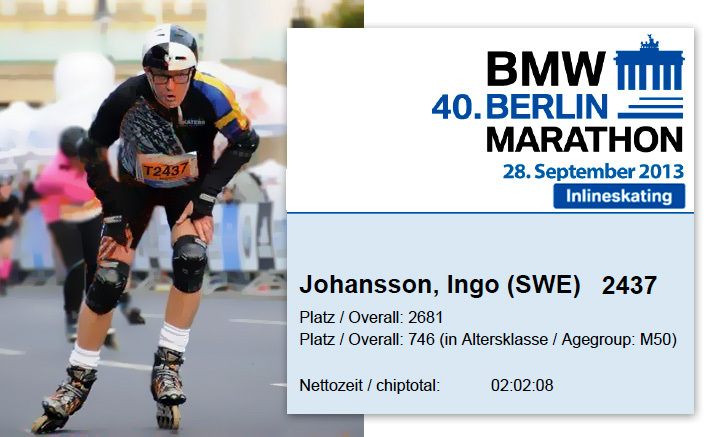 This entry was posted in Rollerskates, Training, Travel on October 7, 2013 by Ingo. 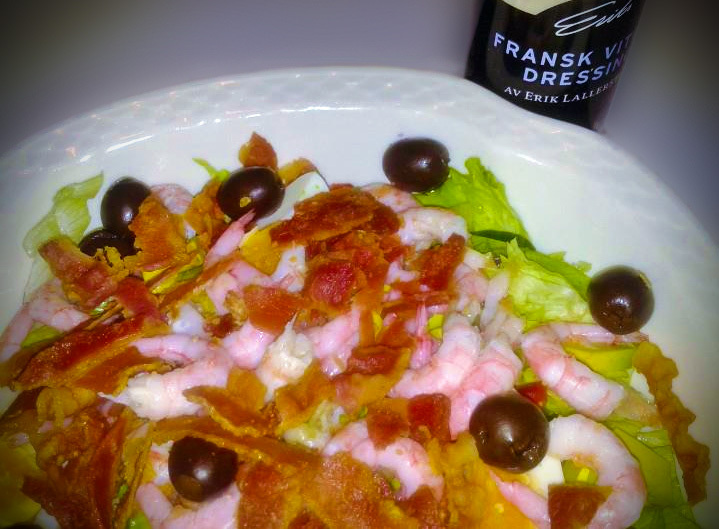 This entry was posted in Training and tagged Training on May 14, 2012 by Ingo. 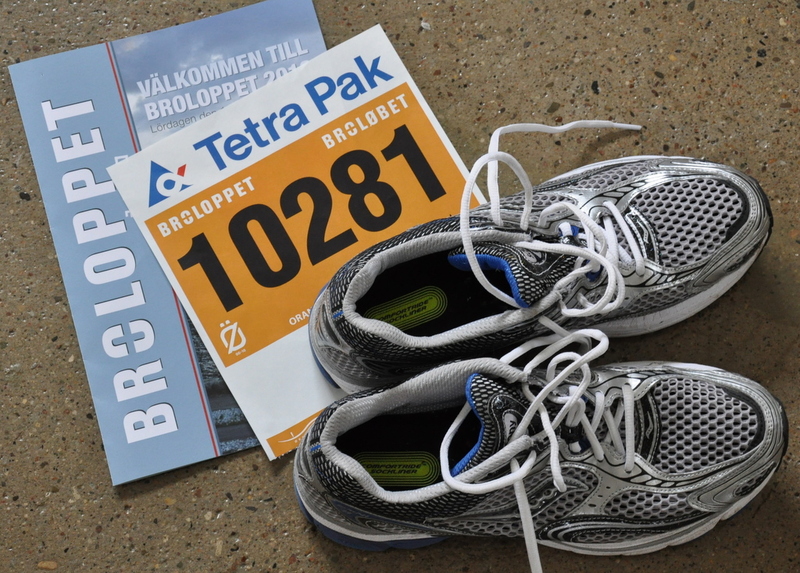 In 2010 I ran a half marathon over the Öresund bridge and this year I wanted to try a city run. My commuting friend, Christian, recommended Göteborgsvarvet. It’s the biggest event in the world of this kind. 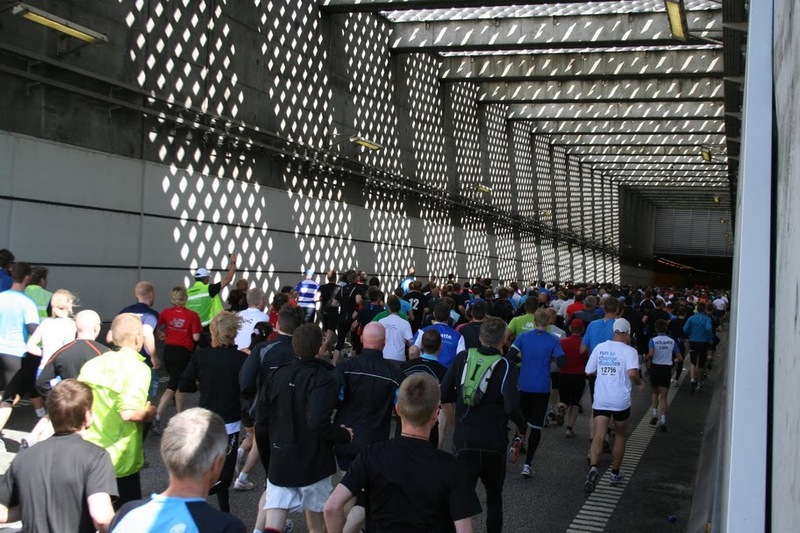 About 60.000 registered runners ending up being around 50.000 that actually take the tour around Göteborg. Since January I used a program from jogg.se together with our neighbour, Cathrine. We started with 2 training 2 times/week and when the weather became warmer and better, we trained 3 times/week. The goal was to finish on 2 hours. We took the train to Göteborg in the morning the 21 May. It seemed like a surprise for the train crew why there were so many people on the train with jogging dress. Fortunately Cathrine had reserved seats. After arriving at the stadium, we had to kill a few hours since we were in the last group starting at 16:00. The weather was nice and there were several big screens and entertainment to keep us occupied. It was great to run through the different kind of scenery, parks, bicycle roads, bridges, harbour side, The Avenue etc. Lot’s of people cheering and lot’s of bands playing, even if we were the last group. Imagine it’s even more party earlier on. Passed the finish line on 2.05.11, which I am very happy with. Another challenge was to manage to reach the train home in time. The last train left Göteborg to Malmö at 19.42 and we had to run the last part – how fun was that with 21,1 km + in the legs already? The public transport between Göteborg and Malmö could be improved on a day like this. I like to thank my coaches Mogens, Christian, Bo (also for letting me borrow his Garmin :-), Andreas and of course the “co pilot”, Cathrine, for helping me full fill this goal. This entry was posted in Training on June 13, 2011 by Ingo. No, I have not completely stopped training. After a spring with a rather high activity level for me with training for and completing the Brolopp in June and lot’s of roller skating with Friday Night Skate during the summer, some of my joints (not the smoking type) have been a little bit congested. One of my coaches suggested to take a break with the jogging and do some fitness training. The plan is to do this program, that I got from a instructor at Novo Nordisk, 2 times a week. Download as PDF. You are welcome to use it if you like. 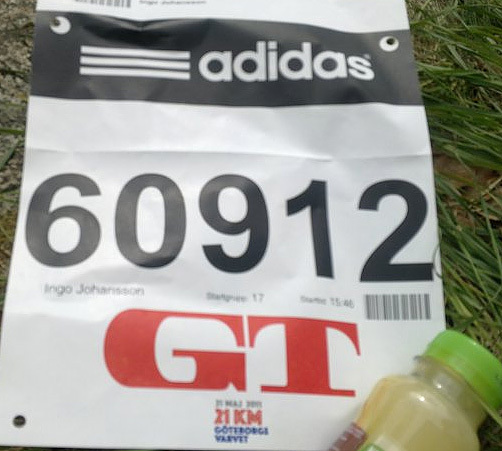 In January I start a running program again to prepare for Göteborgsvarvet May 21. This entry was posted in Training and tagged Excercise, Training on November 20, 2010 by Ingo. The 11 of January I started my training for the ½ marathon over the Öresund bridge. It started with an “agreement” with our neighbor over a glass of wine some time in the autumn 2009. During the long winter I have followed a program i got from smarts.se, some Swedish guys that used to give advice on how to train. During the training period I suffered from aching ankles and one of my coaches meant it could be a combination with “little” bit overweight and running on ice, snow and other difficult “street texture”. The feet and ankles have to compensate for the “insecure” foundation with some micro movements. Instead of running I did some cycling and rollerskating instead. The smarts.se training was much about time and intensity. To find out the intensity for 80% intensity: 0,80 x (max pulse – rest pulse) + rest pulse. The training started with 45 minutes jog with 70% intensity (for me at the time: 0.7 x (195-80) + 80 = 160 bpm) for the first 3 weeks. Then 60 min. for 2 weeks. Phase 2 was 80% intensity 2 times a week and 1 time rush training. During the process I was recommended to try a competition week that included a ½ marathon, just to get the feeling of how long 21 km really is. The last 5 weeks I have been using a program from jogg.se called “formtoppa” that I found more alternate (sorry, but can’t find the link to “formtoppa” anymore). 22 weeks later, that means Saturday June 12, the big day arrived and we, x colleague Søren, neighbor Catrine and Håkan and I took the bus to Kastrup, Denmark. It started to piss down and I got the feeling that if this continue it is not going to be fun. Just as fast the rain came, just as fast came the sun and everything was fine again. 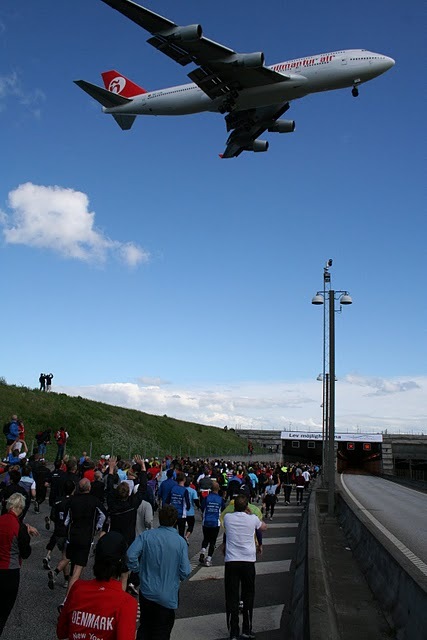 The waiting time was a bit long at Kastrup Beach park and then we walked a few kilometers before the actual start line. The first experience was the planes just flying over us, “waving” with their wings, at least thats was we thought. Next we entered the tunnel and was VERY warm but the “sound waves” was great. On the bridge we had lots of sun, great view and lots of tail wind – a fantastic experience. After reaching land again, people had gathered to cheer and at some places along the way there was music. After 21,1 km I was VERY happy to see the finish line. Was feeling a bit dizzy after passing the line and it was very crowded to get to the water depoes , get a medal and something to eat. Then I had to find the luggage that had been put on a lorry in Denmark. We finished of in style with a great (and late) after run dinner at Casa Swedanes. Thank to all the participants for making this a day to remember. The “Brolöp” was unique in different ways. It is the only race that pass both under and over water and that start in one country and finish in another. My time? 2 hours 11 minutes. A cool slide show from the finish line, made by Sydsvenskan. Swedish blog that describe the day quite well, made by Linda Andersson. This entry was posted in Training, whatnots on June 13, 2010 by Ingo.